My Shoots In the City sessions have been some of my favourite of the whole year, not least because I have had the absolute privilege of meeting so many people from all over the world. Photographing this picture perfect family of three in Morden Hall Park was a great reminder of just how glorious winter can be here in London. I love going back over sessions after the shoot, because I love the fresh perspective it gives me, and I get to relive those magical moments all over again. It's no secret that I love photographing families, nothing gives me greater joy than capturing the special relationships you have with your children on camera. And this fun-filled winter family session over the weekend was no exception. Whenever I have an outdoor session coming up, I can get a bit obsessive about watching the various weather reports, especially if it's a golden hour shoot just before sunset. But if there is one thing I have learned, it is that you can never really predict exactly what the weather is going to do! When we arrived at the park there was lots of lovely dramatic cloud cover and a beautiful even light which lends itself beautifully to lovely portraits. We were also lucky enough to have the sun break through the clouds in a gorgeous sunburst, on the horizon just before sunset. Somewhere inbetween we were also treated to a very brief ice-storm where we were pelted with small hailstones, but thankfully that was very shortlived! I had the best time doing this session, this lovely family were up for having a good time - despite the chill! But their lovely little girl was a bit camera-shy. And it can be quite intimidating to have a stranger point a big camera in your face. But this wasn't a problem because we spent a lot of time playing. We threw leaves in the air, jumped over fallen tree trunks, ran, jumped and twirled and, of course, this lovely little lady had lots of snuggles with mum and dad. Of course, you don't have to take my word for it, because what really matters is not what I think of the photos, it is what the family thinks. This is what Sam had to say about the session: "Love them!!! Thank you so much! Couldn’t recommend you enough! 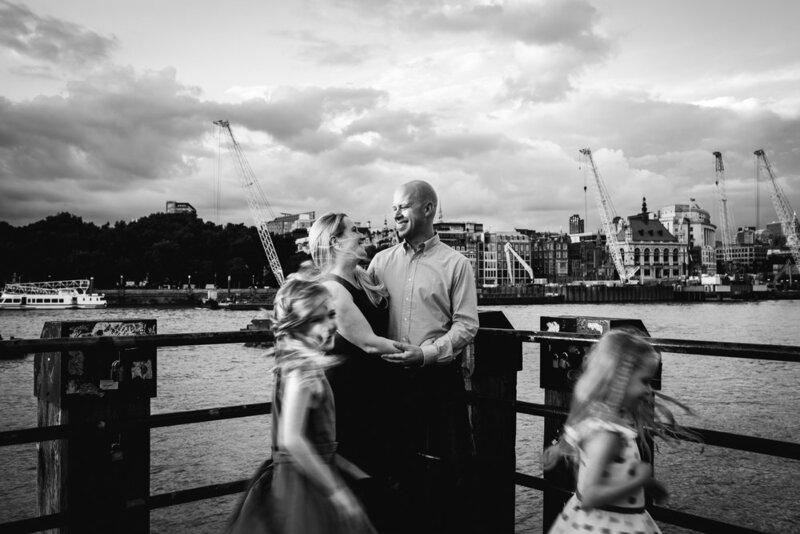 You have a true talent with a camera and also getting a slightly reluctant 3 yr old and her Dad to engage!!!" Would you like some natural, unposed family photos? Are you looking for some fun, natural family photos? I'm a lifestyle family photographer serving most areas in south west London (and further afield too) and I'd love to help you out. It's Mother's Day in just over a month's time and in the run up, I'd like to celebrate all of you, wonderful mums out there. For anyone booking a family session between now and 11th March, I'm offering two free mounted 12"x8" prints of your choice. Contact me using the button to book your session now!